The Route 1 Highway which leads modern day visitors to Big Sur is heavily trafficked and often lacks an adequate shoulder for safe running. That’s why local runners have reverted back in time to the Old Coast Road, the beautiful dirt track which was formerly the primary route in and out of Big Sur prior to the construction of the Bixby Bridge. 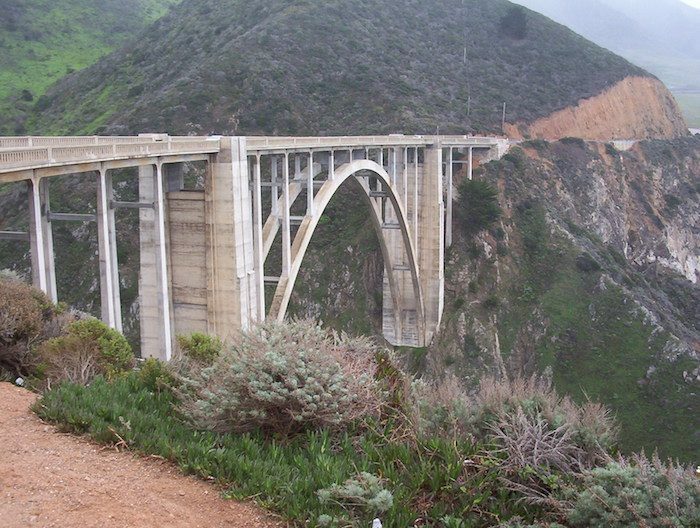 The road covers about 10 miles from Andrew Molera State Park in the south to what is now the Bixby Bridge, and it’s an integral part of the Big Sur Marathon. Unless you’re a marathoner, a complete out and back may be a little much, so we recommend the northern part of the route starting at the bridge. It starts out with a challenging climb, but the elevation is worth it for the high views to the Pacific and the refreshing descent into the canyon along Bixby Creek. The road also makes a nice one-way if you can get a ride or drop off a car at either end. From the Bixby Bridge, it’s about 2 miles out into the heart of the canyon. It follows the creek for about 3 miles (with a decent ascent between miles 2 and 4). Then it drops down to meet up with the Little Sur River for a while, and climbs back up out of the canyon until around mile 8. The last two miles are a sweet and steady downhill into the Andrew Molera Park. These rolling climbs can also be done in reverse from south to north!